Pretty much all of our rules are driven by insurance requirements and the laws of the State of Florida. If you don't like it, take it up with them, but since we want to stay open, we will be enforcing them. Thanks in advance. ALL EVENTS ARE SUBJECT TO CHANGE, EVEN UP TO THE LAST MINUTE! Open pit is not guaranteed for certain race events! We will try our best to accommodate. Check our Facebook page at the time of event for more information. 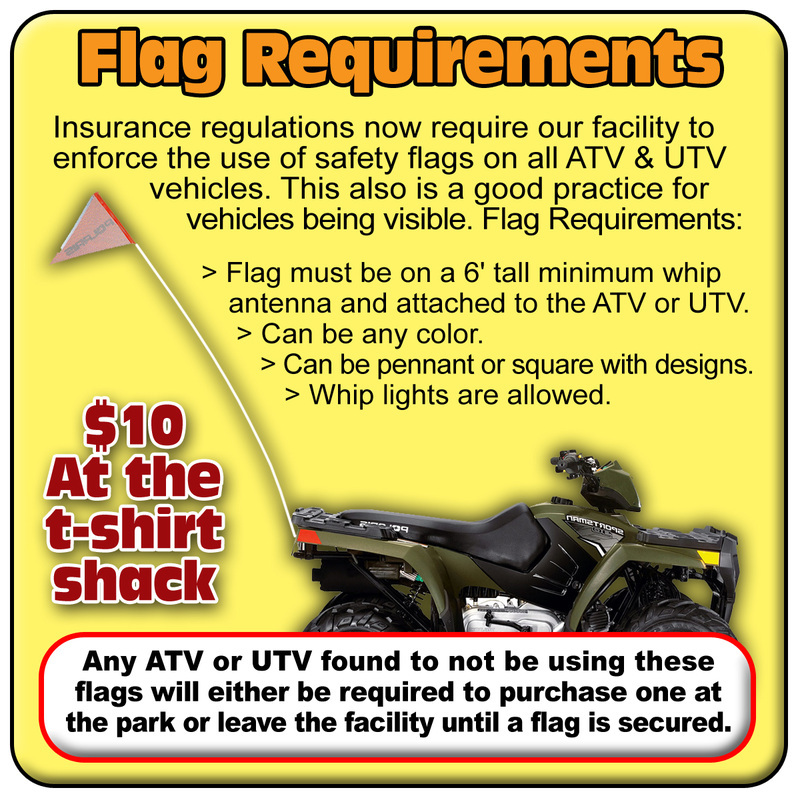 No dirt bikes or 3 wheelers per insurance requirements. 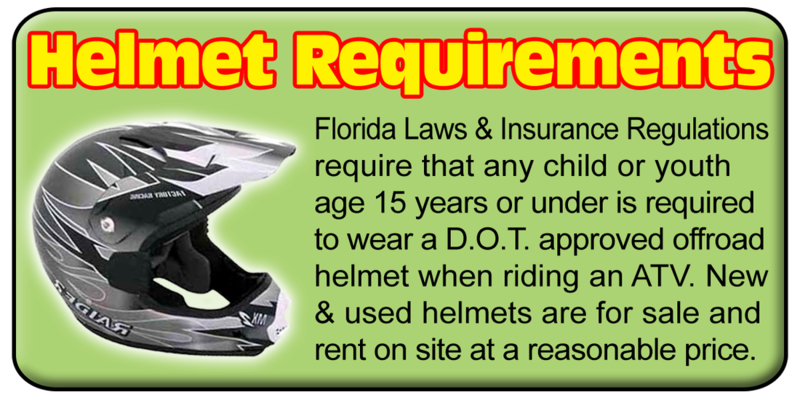 Anyone under the age of 16 must be accompanied at the event by an adult and wear a helmet while riding ATV's per insurance requirements. All golf carts or related type buggies will be considered ATVs and must stay in the designated area and follow all helmet & safety flag rules. No glass containers. It is a safety issue. No underage drinking. We have deputies that go around specifically looking for this. No fighting. Police yourselves as needed and inform staff and deputies of any unruly behavior. This results in immediate removal from the property. No reckless driving. Sheriff deputies can ticket you for this. No dumping of hazardous material (oil or gas). No littering. Please help us keep our park clean. No one will be allowed to ride on the outside of any vehicle at any time. Children will be allowed to participate ONLY after the parent or guardian signs a release of liability form. The management has the right to deem any child to be too young or unsafe and will not be allowed to participate. The management has the right to refuse entry to anyone and also has the right to remove any unruly participant. If any laws are broken, sheriff deputies are on site and will issue citations as needed with the possibility of arrest if deemed appropriate.